Need a fast and easy Low Carb Chicken Marinade that uses ingredients that you have in your cupboard? Look no further, this is the chicken marinade for you! It uses the convenience of bottled BBQ sauce that is then amped up with simple ingredients that you already have at home to make one delicious dinner! It’s also only 8g of carbs, making it perfect for those who want a low carb option! This is much better than using just a BBQ sauce, especially because BBQ sauce has typically been my least favourite thing to use on meat when grilling it. However, by turning some ready-made sauce into a marinade with some other ingredients it’s literally the best of both worlds. 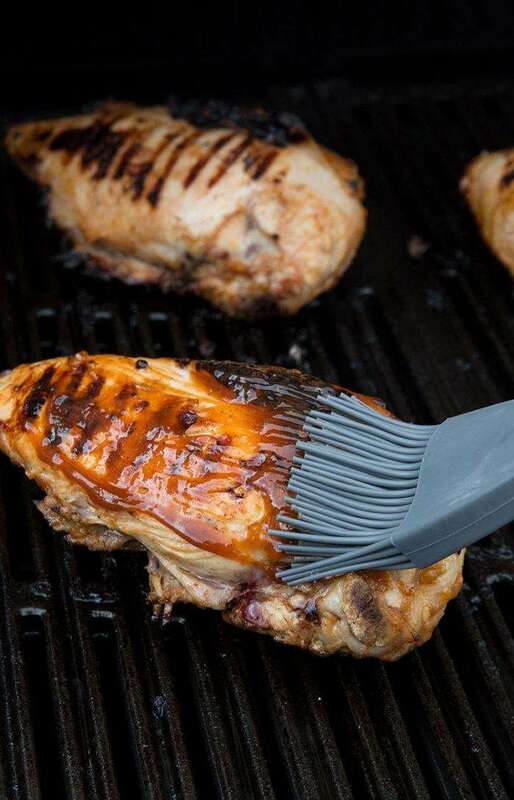 Rather than just the overpowering flavour and thickness often found in bottled BBQ sauces, this improves upon it while turning it into something you can marinate your chicken in for the day. 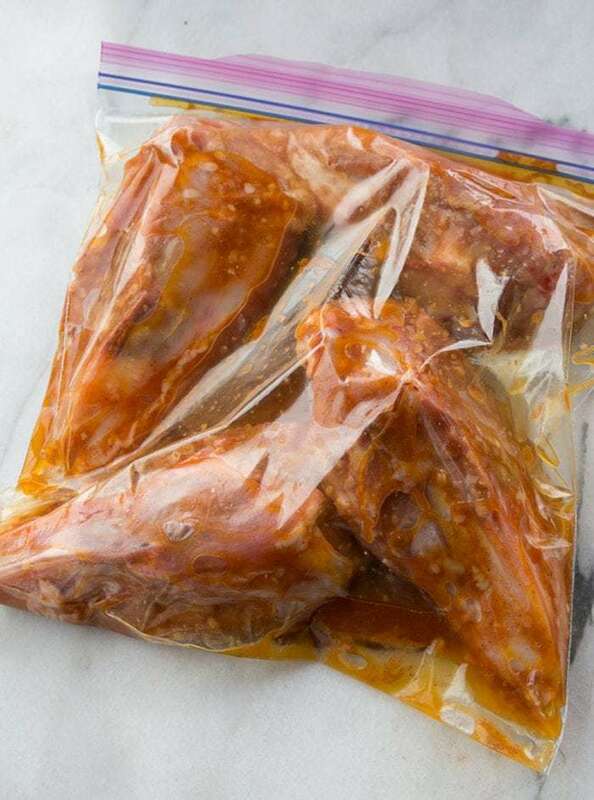 Marinade within a large resealable plastic bag. Should You use Skinless or skin on chicken breast? Boneless or bone in chicken breasts? Most of the time, I can never get the skin to really stay on and not stick. 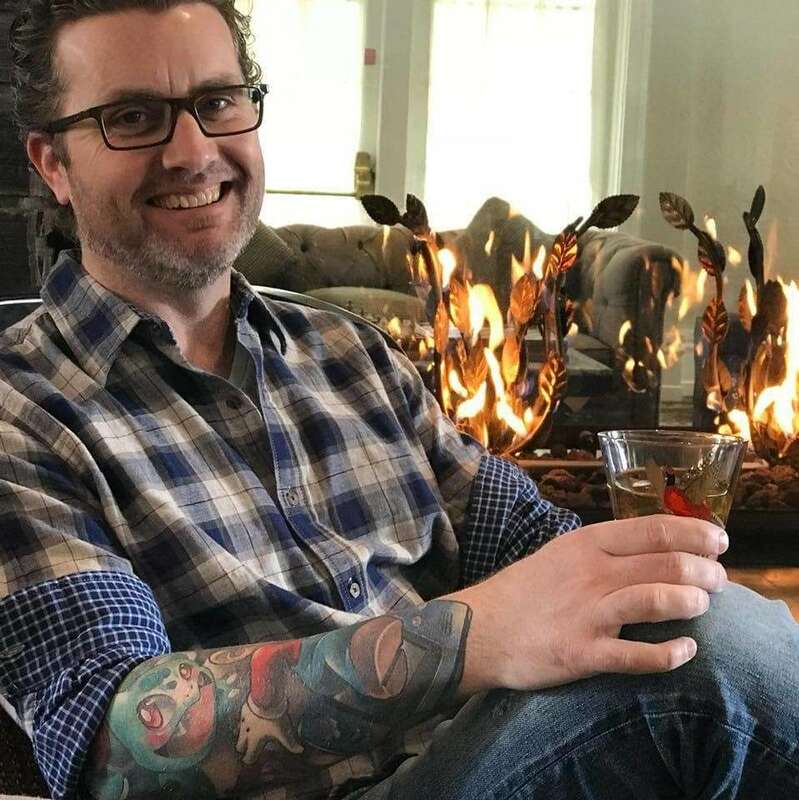 I prefer to use bone-in, skin on chicken breasts. The skin is going to give you some much needed added fat to your chicken while you are grilling it. Once the skin starts to shrink smaller, you then baste the top of the chicken again to keep it moist and seal in the juices. Why bone in chicken breast? That layer of gristle and bone helps to keep the chicken juicy. The skin helps seal it at the top and the sauce and the bones help to seal in the juices from the bottom. 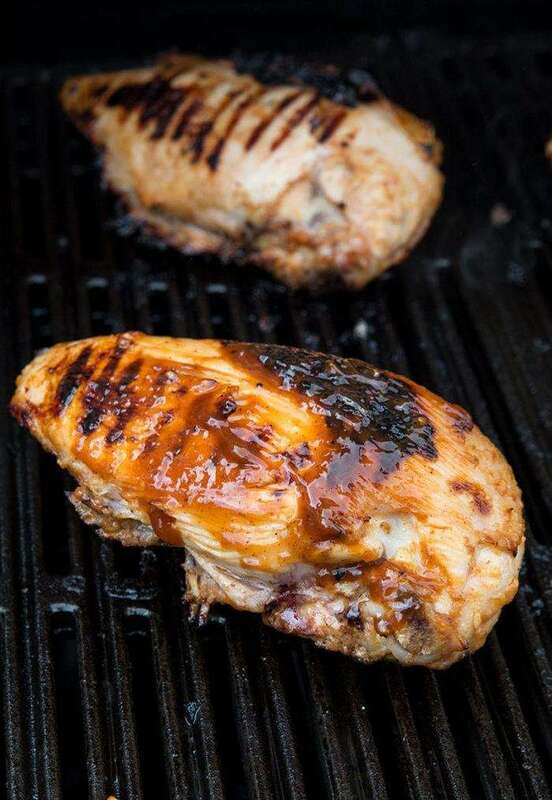 This leads to tender, juicy chicken breasts when we use bone-in chicken breasts. When you grill, bone-in is the best. 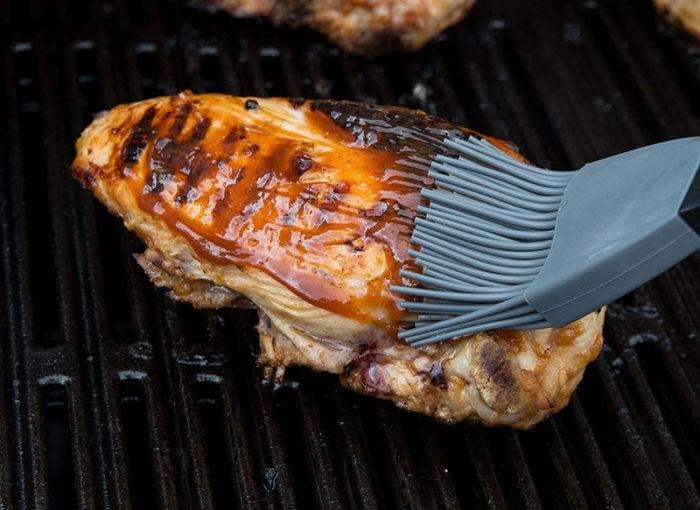 Try it and you’ll see – your love of grilled chicken is going to jump a level! Basting Chicken with Low Carb Barbecue Chicken Marinade. Trust me and try the bone-in and skin on chicken. You are going to consider boneless, skinless chicken breast to be dry shoe leather compared to this. 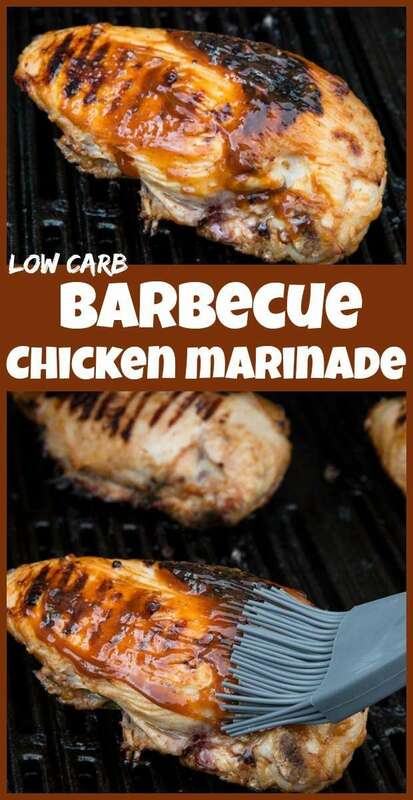 Need a fast and easy Low Carb Barbecue Chicken Marinade that uses ingredients that you have in your cupboard? Look no further, this is the chicken marinade for you!